Located in Karve Nagar, Pune Meekan Interiors is a reputed and widespread name in interior designing. They are also into turnkey interior contractors. Being endowed with as many as 50 labours, some of them highly skilled while others still being new in the arena learning a few tricks of the trade and honing their skills Meekan Interiors boasts of a great unit who leverage a world of experience and exposure in the niche of interior designing. They are passionate bunches who are always looking to improve and raise the bar with every endeavour. They are well-equipped with high-tech and contemporary machineries to cater gypsum work, granite, electrical, HVAC carpentry, Civil, Plumbing, marble work, tiles work and plenty more. 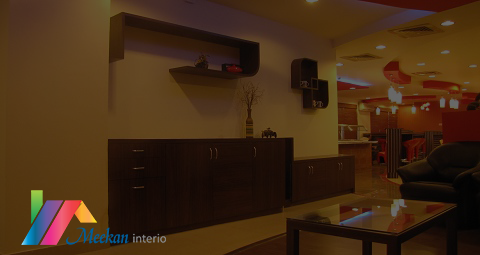 Be it services or material, Meekan Interiors have got it all covered under a common roof. Meekan Interiors is more than capable and prudent enough to design and execute projects of any size, volume and scale with ease and utmost perfection all over India. Meekan Interiors are absolutely experts and masters of Commercial Interior Design, Residential Interior Design, Modular Kitchen Design, Bathroom Renovations & Design, Jewellery Shop Design, Turnkey Solutions, etc. Meekan Interiors is one such company that always gives top-notch priority to customer needs and demands and fulfil them accordingly providing them with ultimate customer satisfaction all the time and all the way. Commercial interior designing is one of the foremost services that is rendered by Meekan Interiors. They are undoubtedly the best commercial interior designers in the country. With Meekan Interiors, commercial interior designing in Pune has reached a new level altogether climbing to eloquent heights. There are a number of commercial interior designers in Pune but Meekan Interiors is certainly the best of them all with none other able to match its exemplary standard. Meekan Interiors have already successfully completed many commercial interior designing projects and that too with great authority and conviction. The designers at Meekan Interiors very well comprehend the fact that every commercial, whether it is a public destination or a retail store is one community in which each and every component is directed with a purpose of connecting with the customers and clients. The Meekan Interiors is the best commercial interior designers in Pune not just for their exotic works but also for their premium services. They handle all commercial interior decorations like company workplaces, residential complexes, jewellery shops, departmental stores and to a distance of giving great interiors for even a shopping mall with aesthetic proficiency, hassle free schedule and cost effective schemes. They are competent in drawing up authentic and original interior design plan for any and every set up all over India backing it up with quality resource materials, good sponsors, expert and artistic taskforce, great post service schemes and our well established turnkey solutions. They are here to make their clients' feelings for their customer a reality with warm and beautiful interior decorations.